We momentarily interrupt economic news with some celestial news that may be of interest to millions, including some of my readership. 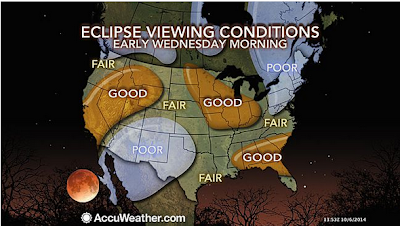 Wednesday morning, in the early AM, a full lunar eclipse will turn the moon red. The lunar eclipse will be visible over much of the US, especially the West. "It's not that often that we get a total eclipse from the United States; sometimes we go years between getting them," Slooh Astronomer Bob Berman said, adding that it is a very unusual situation. "If you had to pick one time to set the alarm and go out, I'd say do it at 6:15 a.m. EDT," he said. And indeed, during a lunar eclipse, the sun and moon are exactly 180 degrees apart in the sky. In a perfect alignment like this (called a "syzygy"), such an observation would seem impossible. But thanks to Earth's atmosphere, the images of both the sun and moon are apparently lifted above the horizon by atmospheric refraction. This allows people on Earth to see the sun for several extra minutes before it actually has risen and the moon for several extra minutes after it has actually set. If I had my choice of locations I would pick somewhere on the West coast, perhaps a place like Joshua Tree National Park with interesting rock formations and trees in which to frame the moon.